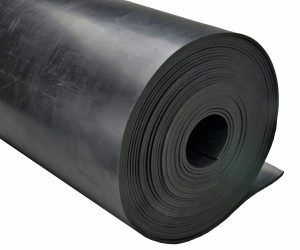 Skirtboard rubber is a durable and versatile rubber sheet made from an abrasion resistant SBR (styrene-butadiene rubber) blend. Offered in a variety of stocked pre-slit widths, skirtboard is designed for use as chute lining, in conveyor belt systems, as wiping blades or as mounting pads. It is also a versatile and durable material for bumpers on equipment or surface pads in workshops. Available with a square-cut or 45 degree beveled edge (in 3/8 and ½ inch thickness only). New Orange Natural Rubber Skirtboard available for abrasive & abusive applications. *Part numbers are for straight cut edge product. For beveled edge please inquire. **Weight is for 10 inch wide material. For other widths, calculate weight per inch by dividing the listed weight by 10 and then multiply by desired width in inches.